On Tuesday the New York City Landmarks Preservation Commission approved the most recent plan submitted by the museum for the expansion and renovation of the 1914 Gilded Age mansion it calls home in a 6 to 1 vote with one abstention, the New York Times reports. Three prior attempts by the museum in a quest to gain more space for exhibitions and programs were turned back amid vocal protests by neighborhood advocates and preservationists. The revised plan submitted by the project’s architects Beyer Blinder Belle and Annabelle Selldorf includes the decision to restore the museum’s original gated garden, which had been a point of controversy with those opposed to the project. 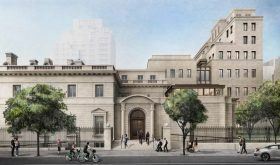 The planned expansion of the Frick Collection is delayed again after the Landmarks Preservation Commission decided Tuesday to not vote on the project, following hours of public testimony. Dozens of neighborhood advocates, preservationists and museum goers attended the hearing to discuss the Beyer Blinder Belle and Selldorf Architects-designed expansion, which would include 60,000 square feet of repurposed space and 27,000 square feet of new construction. The plan would expand the existing Upper East Side building’s second level, add two set-back stories above the music room and an addition behind the Frick Art Reference Library. According to Curbed NY, critics of the expansion said the additions would be too large and block the design of the existing library. Despite a presentation from head architect Annabelle Selldorf, no decision was made about whether to grant the $160 million project its certificate of appropriateness. The Frick Collection has unveiled its $160 million Selldorf Architects-designed upgrade and expansion, which will open up the private living quarters of Henry Clay Frick’s original 1914 home to the public for the first time. As the New York Times explained, the renderings illustrate a plan to expand the existing building’s second level, add two set-back stories above the music room, and an addition behind the library that will match its seven-story height. These will house a 220-seat underground auditorium, an education center with classrooms, in addition to a renovated lobby and larger museum shop. The thoroughly modern gut-renovation of this 1869 single family home at 281 West 4th Street is the creation of noted starchitect Anabelle Selldorf, and we’re assuming that its romantic-contemporary decor was inspired by the owners’ creative talents. Luxuries, comforts, and conveniences fill this somewhat narrow, 2,720-square-foot historic private home, from a finished and functional cellar to a planted and enchanted roof garden. 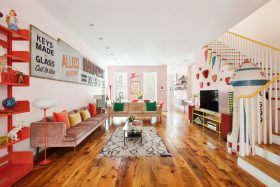 For the why-own-when-you-can-rent-for-more monthly price of $29,000, you can step into this dream of a West Village townhouse, cue up a rooftop party and fire up the parlor-floor movie screen. 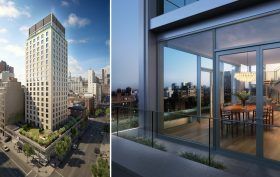 William Macklowe Company’s 22-story 21 East 12th Street (21E12) is poised to become the tallest ground-up condominium building in Greenwich Village upon completion in 2018. The development at the southwest corner of University Place and East 12th Street replaces the Bowlmor Lanes garage building, which, due to its height and incongruent massing, ruffled the feathers of watchful neighbors and community organizations. Nevertheless, the squat, five-story structure has been razed, and site excavation is well underway for New York’s maiden of modernism, Annabelle Selldorf‘s, square, cast-stone tower. 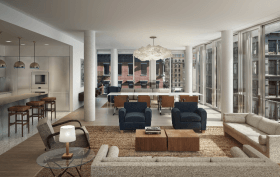 Sales officially launched today at 42 Crosby Street, Atlas Capital Group’s 50,000-square-foot Soho condominium designed by Annabelle Selldorf of Selldorf Architects. 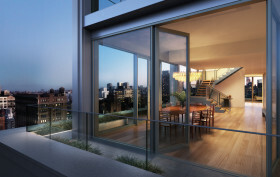 Nine three-bedroom residences and a penthouse at the seven-story luxury residence will start at $8,250,000 (the penthouse is going for $25 million). 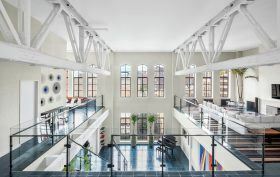 According to the press release, the building’s design offers “a contemporary interpretation of the Soho neighborhood’s cast iron architecture,” and of course, there’s those $1 million parking spots.